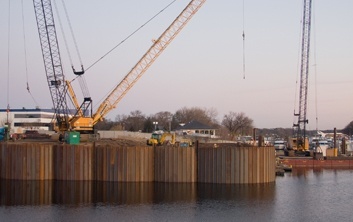 When it comes to building docks and barge terminals, Brennan is second to none. We have built high-quality structures throughout the inland waterways from both the land and from the water. This includes dry bulk terminals, liquid bulk terminals, heavy lift docks, cellular structures, sheet pile walls, marinas, and more. As a marine contractor that has a Harbor Management Group, we know what an efficient dock operation should look like and work with our clients and their engineers to optimize the structure to meet their needs. In addition to dock construction we can install mooring structures used to secure barges while in fleet. Our experience includes dolphins, seawalls, tripods, clusters, quadripods and more. In each case we will work with our clients to provide a solution for their individual operation. These are structures that we not only build, but we use them on a daily basis and are familiar with the fine details that should not be overlooked. If you are looking to extend the life of an existing structure, contact us for underwater inspections and survey. Our divers are the best in the business and know river-based infrastructure. They can carry out an underwater inspection and provide repair solutions to save money and extend the life of your facility. We will work closely with you to find a repair that will best fit your structure, and your budget. 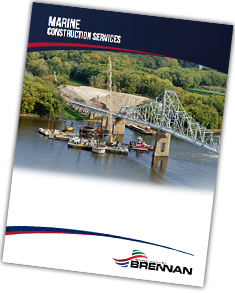 Want more information on industrial docks and barge terminals? Please fill out the form below!